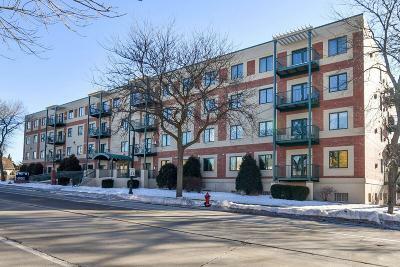 Shorewood 2 BR 2 BA condo with coveted western exposure to enjoy afternoon sun and sunsets! Elevator from underground parking so NO steps. Neutral decor, hardwood floors, , ceramic tiled baths, front load washer & dryer. Maple kitchen cabinets w/pantry cabinet & pull out tray shelves, stainless appliances, solid surface counters & large breakfast bar plus dining rm. Huge carpeted living room with fireplace & access to balcony. Great closet space plus large storage locker. An exercise rm, community rm, secure lobby, underground parking plus a convenient location close to Shorewood's shops on Oakland complete the picture for this special condo!